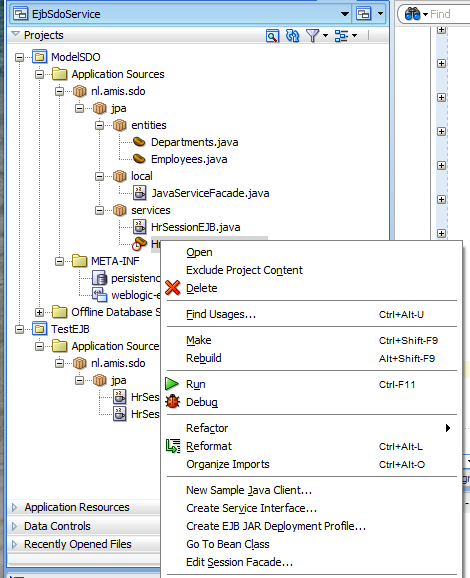 In Oracle SOA Suite you can use the EJB adapter as a reference or service in your composite applications. The EJB adapter has a flexible binding integration, there are 3 ways for integrating the remote interface with your composite. 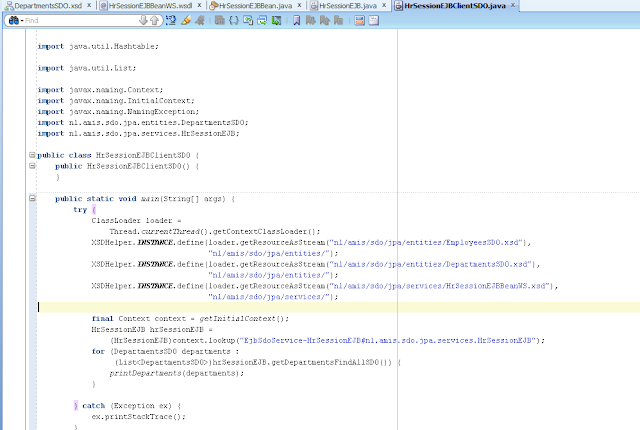 First you have the java interface way which I described here this follows the JAX-WS way. 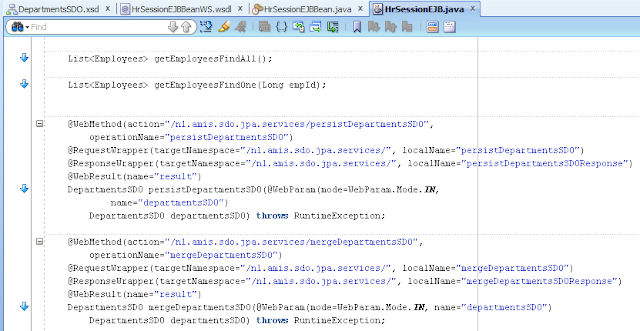 It means you need to use Calendar for your Java date types and leads to one big WSDL when you add a wire to a service component. Second way is EclipseLink Moxy this solution is great when you can't change your java interfaces. 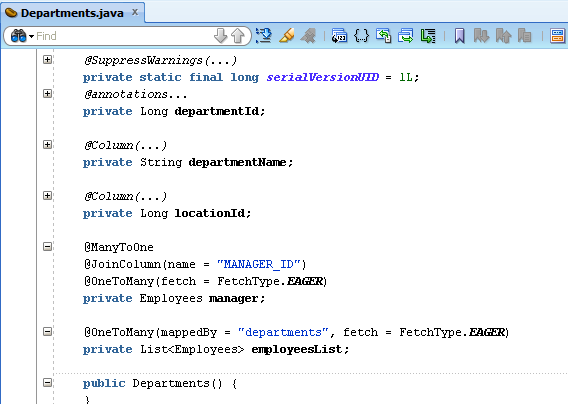 Antony Reynolds made a great blogpost how to use EclipseLink moxy in Oracle Soa Suite. 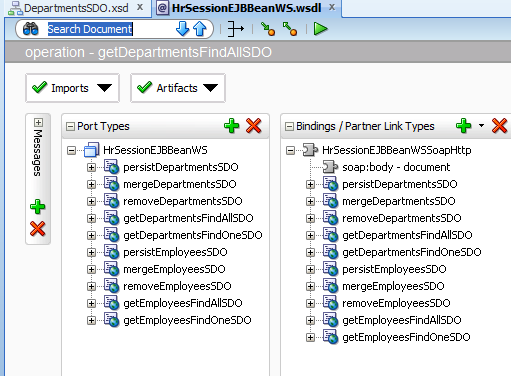 The last way is generating a Service Data Object (SDO) service interface on your EJB Session Bean, This leads to a WSDL with a operation XSD and entity XSDs which can be used / read by the EJB Adapter ( no one big WSDL ). 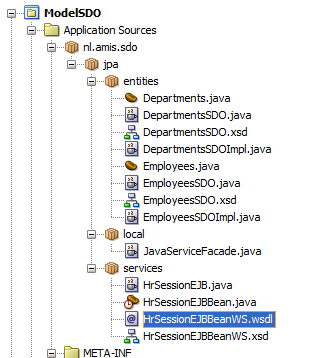 Use the java data types you want to use, JDeveloper can re-generate the SDO interface and no need to drag a dummy wire to refresh the EJB WSDL when you change the EJB Session bean. In 2009 I already described this SDO feature but now with Patch Set 5 this SDO feature is finally working well. Before PS5 it was really hopeless. So let's explain how this works in PS5. I already made a simple HR JPA Model project with a EJB Session Bean. Before we start we need to think about lazy and eager object loading. In this Department entity I will eager retrieve the manager and employees of this department. 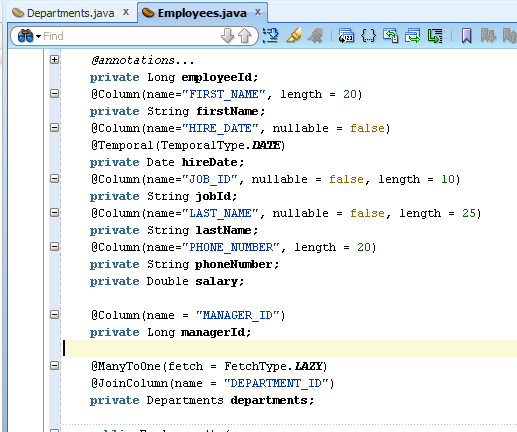 In the Employee entity I will use the Lazy fetch type on the department attribute. 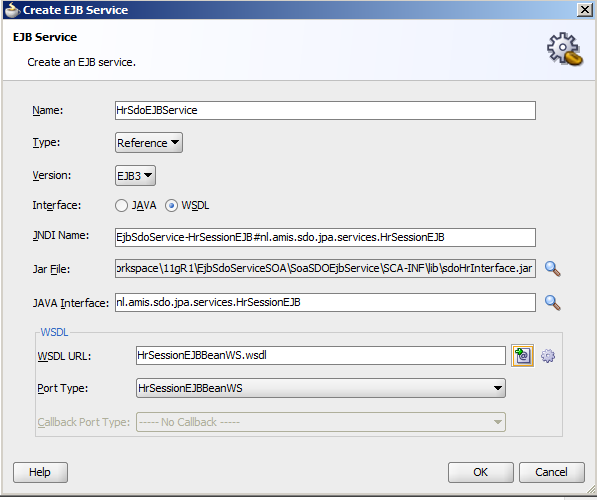 Select your EJB Session Bean ( Right Click ) and select Create Service Interface. When we want to use this SDO interface in Oracle SOA Suite we need to enable the Configure as an ADF-BC Service. This will add the necessary SDO annotations on the Remote Interface. 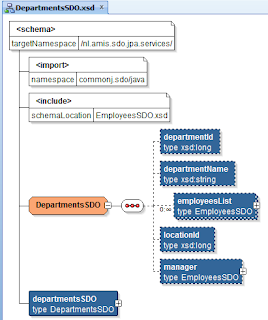 The generated Department entity XSD. 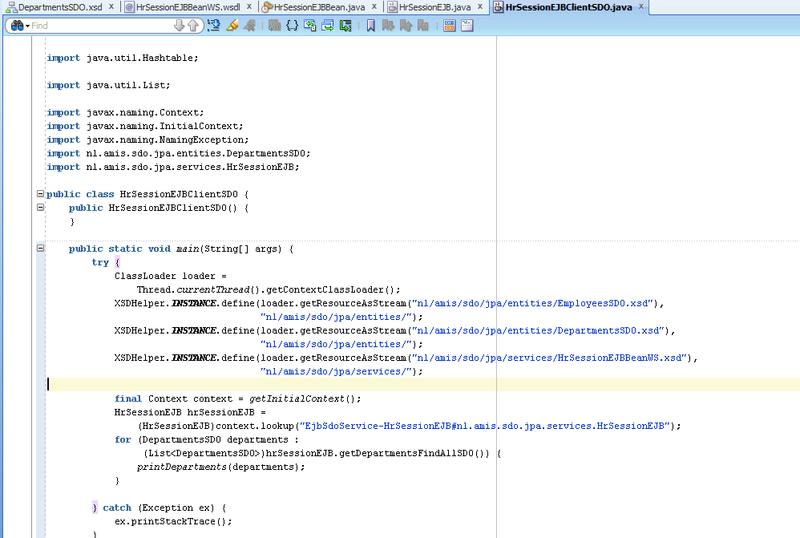 JDeveloper adds PortableWebService annotation to the EJB Session bean. The remote interface with all the web annotations on a SDO method. Also when you want the same behaviour as a Database adapter you can force to start a new transaction and not take part in the BPEL transaction. This way you can see if the transaction is successful at the end of the invoke instead of the end of BPEL. 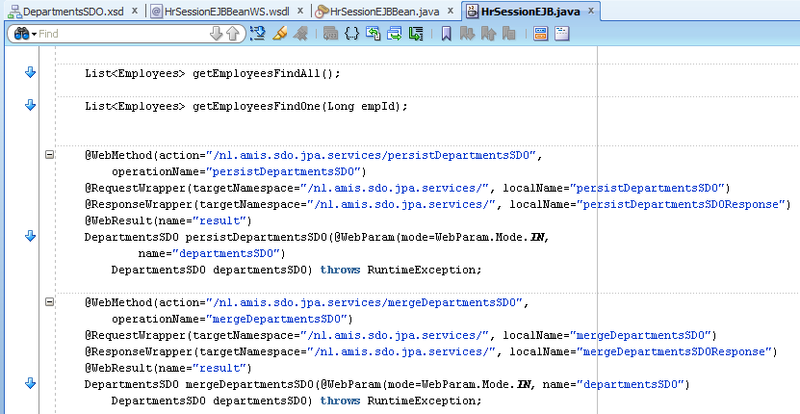 JDeveloper also adds code to the EJB Session Bean to marshall and unmarshall the java or xml. Think about which attributes can be empty else you will get some null pointer exceptions. Also it will load all the SDO XSDs in the EJB Session Bean. If you don't have circular XSD references then loading should be successful. 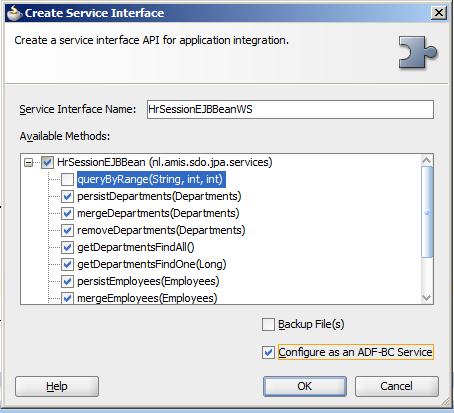 In a java client we can test the SDO interface ( this will not use the remote interface annotations) by first loading the XSDs and invoking a SDO session bean method. 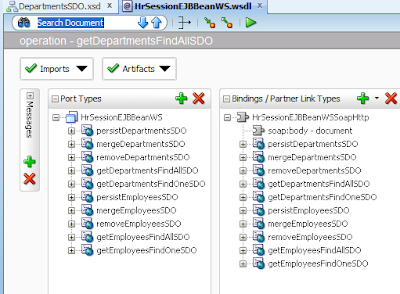 Loading of the XSDs is necessary else you will get some EclipseLink objects instead of the department of employee objects. 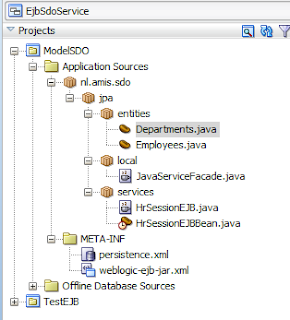 Deploy the EJB to the SOA Suite Server and also generate an interface jar which does not contain the meta-inf folder and the Bean. Now is the time to configure the EJB adapter in Oracle SOA Suite. Drag the EJB Adapter to the reference side of the composite. Lookup the jar and the WSDL. The wizard will copy the interface jar and WSDL, XSDs to your project. Fix the jndiName bug in the reference service, go to source mode of the composite.xml , rename the uri attribute to jndiName. Finish your composite and deploy it. When you go for a test drive you will see something like this. Here you can download my example project. In an asynchronous web service we can't return a soap fault like a synchronous service but that does not mean you can't report back the fault to the calling asynchronous process. basically you got three options. Off course handle the fault in the error hospital and give back the response. 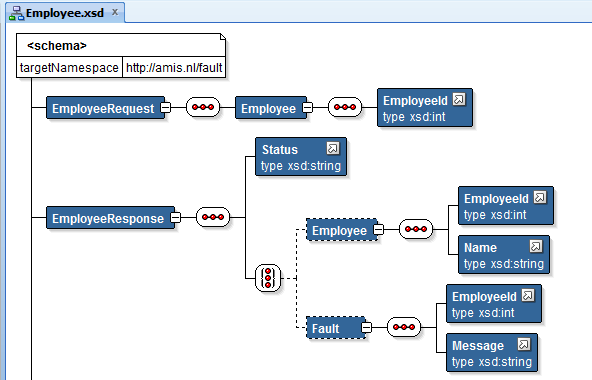 In the response message you can add a section ( a XSD choice with success and fault section) which can be used for faults. 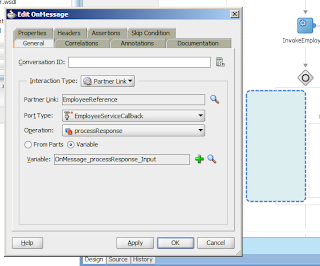 Do a callback to a common fault operation of the calling process. 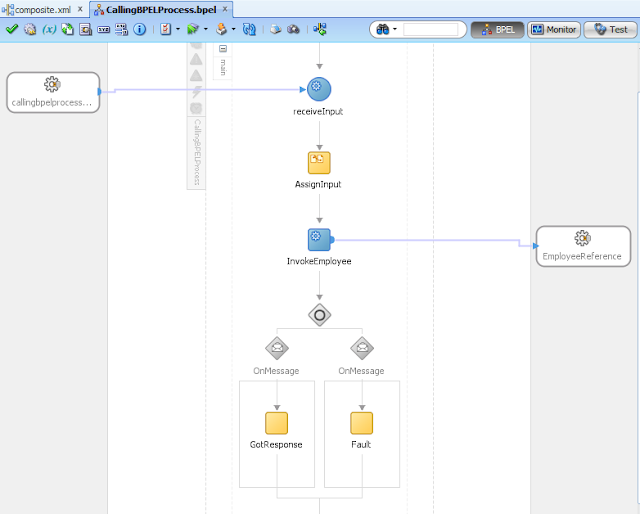 This can be a JMS message with the messageId/correlationId or a Web Service invocation where we use the correlation of BPEL to match the fault message with the right process. 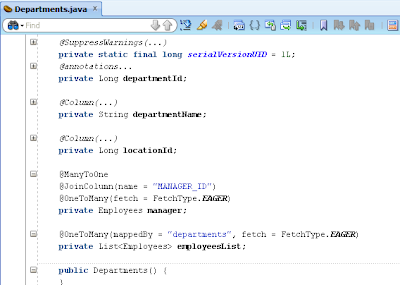 In this blogpost I will show how to implement the last two options in Oracle BPEL. First we start with returning the fault in a response message. For this I added a status element to the response and a choice for a success and a fault . 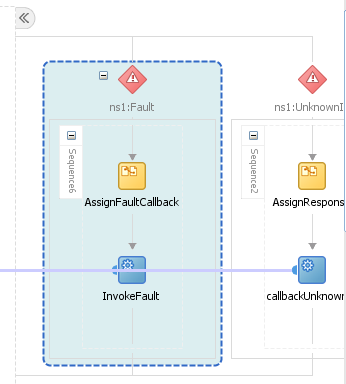 In the catch section you can also invoke the callback response and in the Assign activity you can fill the fault section of the response message. Do a fault callback to the calling process, for this we need to do the following. 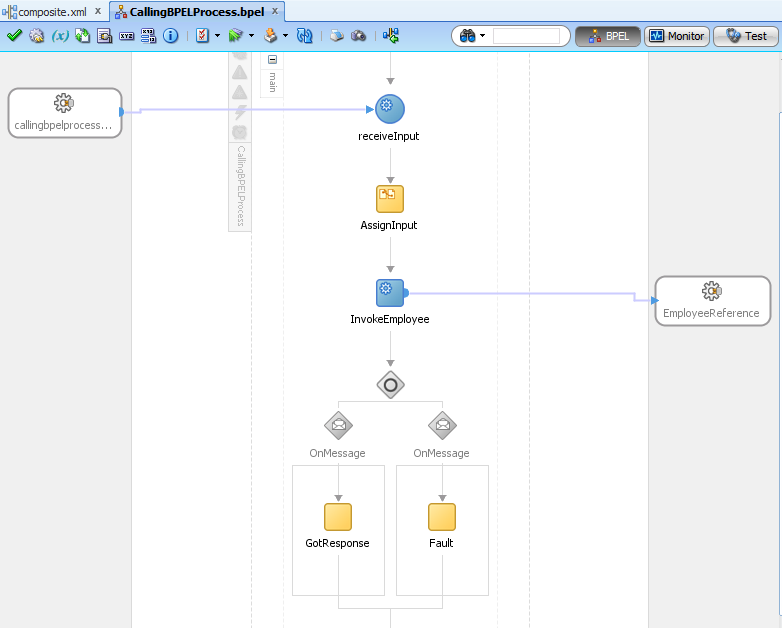 Create an Asynchronous BPEL process. Define a fault response schema. The EmployeeId element is necessary, we need this for the correlation of the BPEL processes. 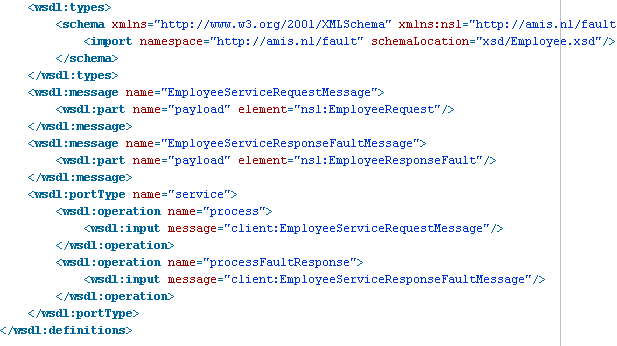 Then make a new WSDL with the fault callback operation and add a fake endpoint. ( we will override this endpoint from BPEL, because we don't know the endpoint of the calling process). Add a FaultCallback reference web service based on this WSDL and add a wire to the BPEL process. 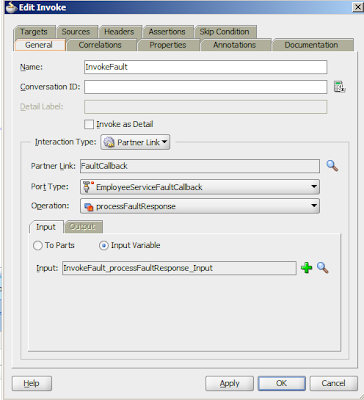 In the BPEL receive activity, we need to capture the fault callback url. We can optional use this for the fault response endpoint. Go the properties tab and capture the value of the faultToAddress property. Put the value in the faultCallBackUrl variable. 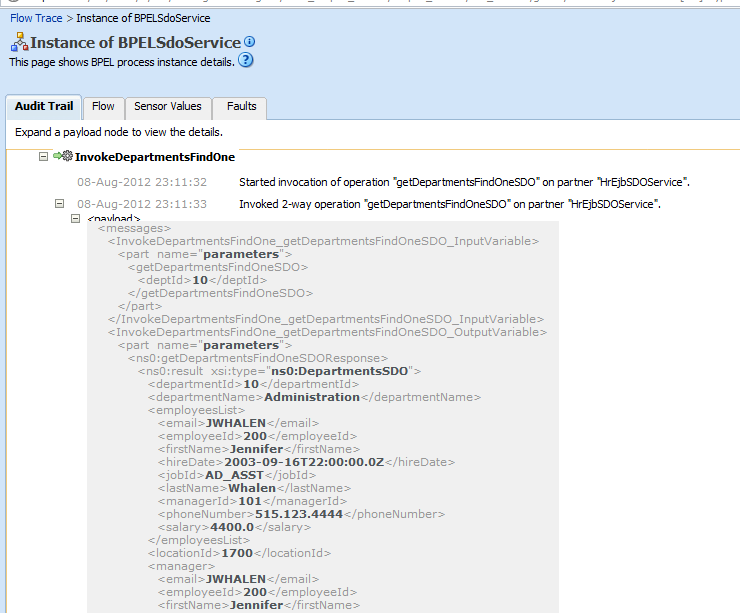 In the Catch section of the BPEL process we can invoke the fault reference service. 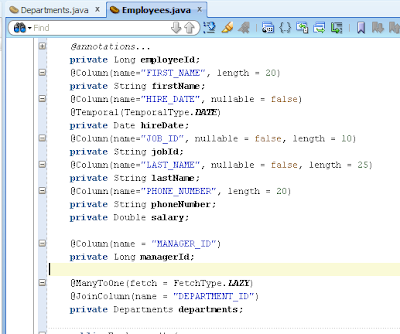 Off course use an assign to add the EmployeeId and provide a fault message. Open the fault invoke activity and go to the properties tab. 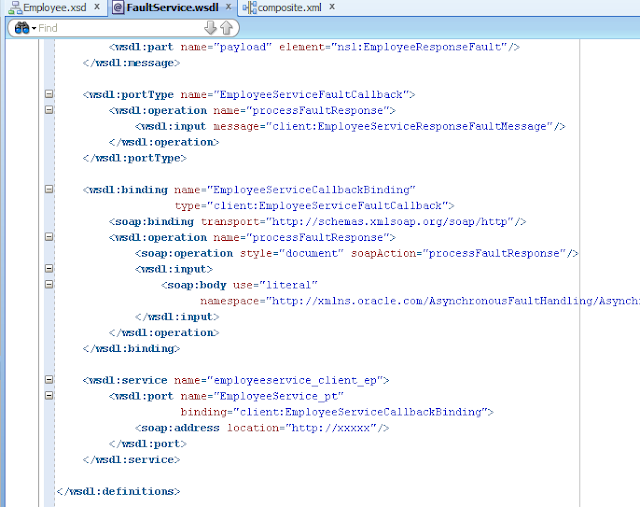 We need to set the endpointURI property with the faultCallBackUrl variable value. That is all for the Asynchronous Service. 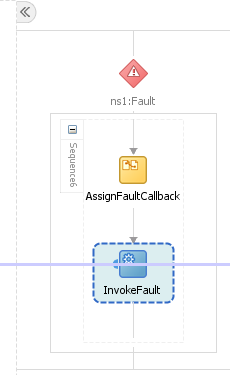 Next step is to use this Asynchronous Fault Service in an other asynchronous BPEL process. We need to make a WSDL ( contract first ) with a portType which also contains the fault operation, this must match with the reference WSDL of the Asynchronous Fault Process. 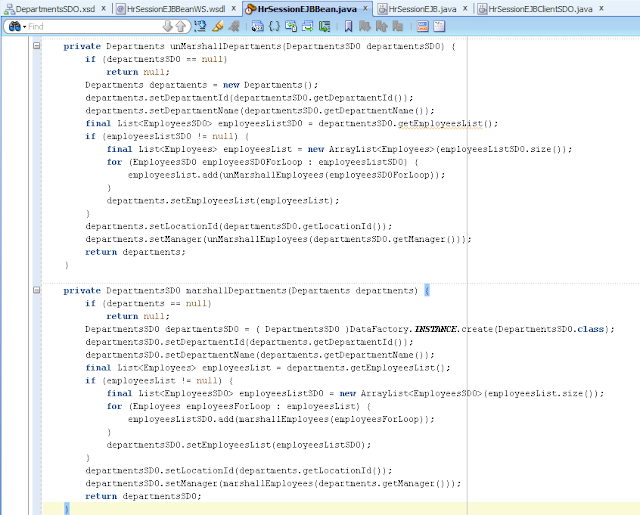 So operationName, Message and namespace must match. Create a new BPEL process which is based on this WSDL ( expose this BPEL as a service ) and also add wire the Asynchronous Fault process. 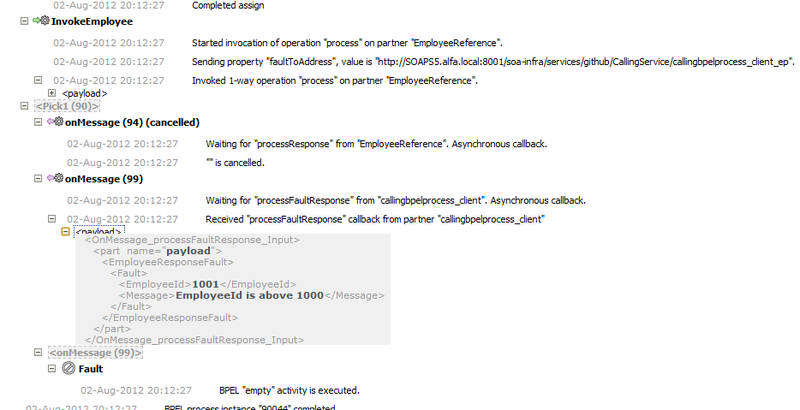 This is the process with InvokeEmployee activity which calls the Asynchronous Service. 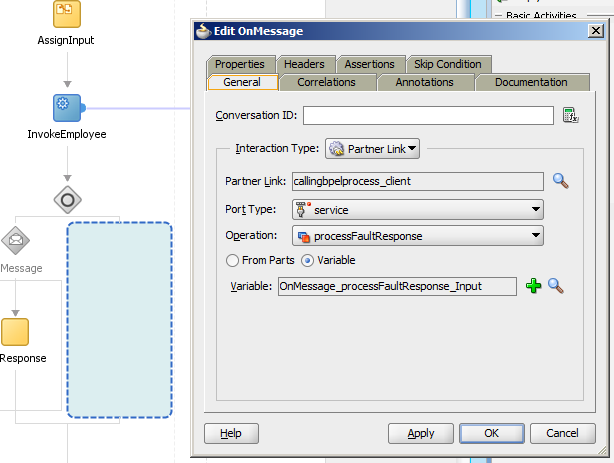 Open this invoke activity and go to the properties tab where we set the faultToAddress property. 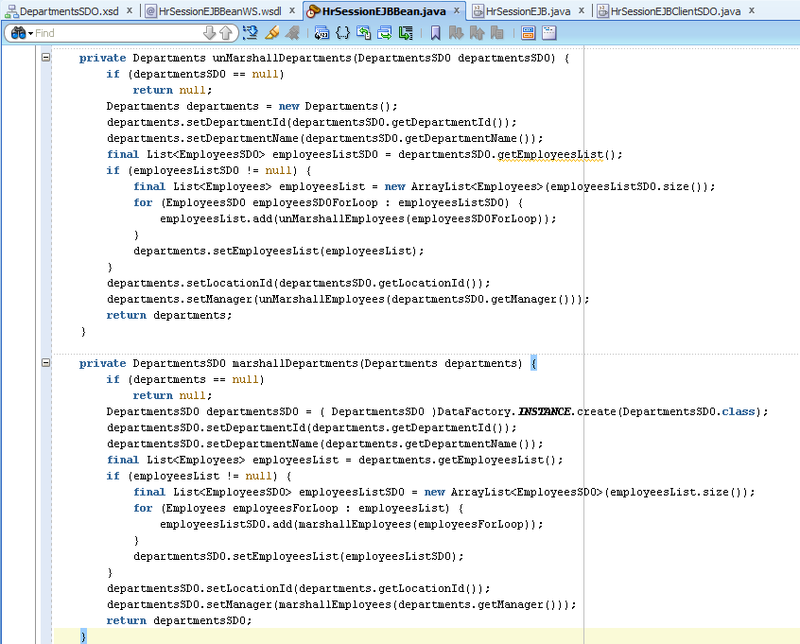 This is the endpoint of this BPEL process and will be used for the fault callback. After the invoke we need to use a pick activity and add an extra onMessage to the pick activity. First OnMessage will be used for the normal callback situation. The second will be used for the fault Response. 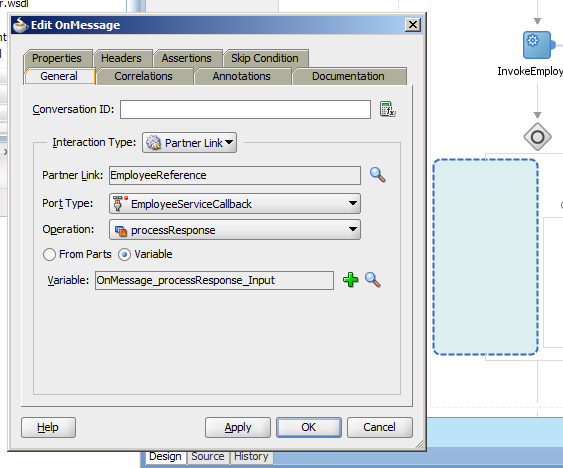 The last step is to setup correlation in this BPEL for the returning fault message. 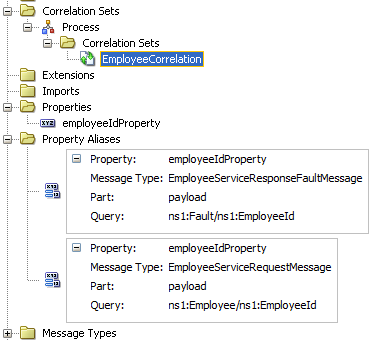 on the receive add a correlation set and initiate this ( I got a NPE when I tried to set it on the invoke ). The Set is based on the employeeId element. 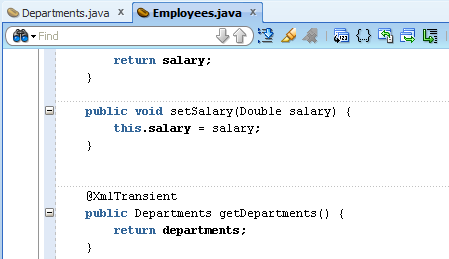 Add two Property Aliases , first is based on the employeeId element of the Fault Message and second is the employeeId of the request message. 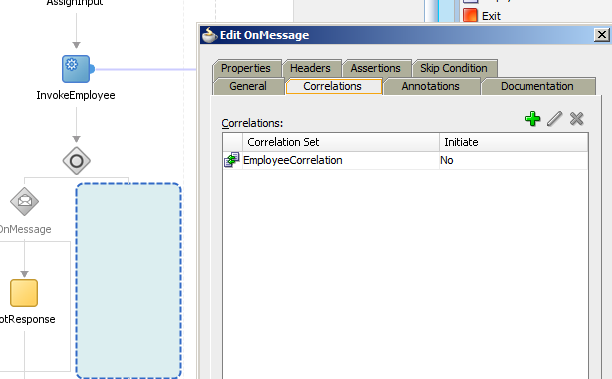 On the fault OnMessage we need to add the same correlation set and this time we don't need to initiate it. If everything is Ok we will see the following in the Enterprise Manager. 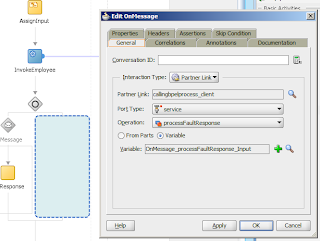 on the invoke we set the faultToAddress, the normal response OnMessage is cancelled and the fault OnMessage gets a response with the fault message.